This Meeting Time business ecards are part of a quirky set designed especially for the work place. There is nowhere quite like an office or business environment for this little in jokes that really only mean anything to those who work there. If you don't believe us think of the last time you and your colleagues were in stitches over something one of you had said or done. Now relay that story to someone in your life outside of the office, you will be lucky to get a forced “ha ah” sound from their throat before they quickly change the subject. Thanks to technology you can now share a joke surreptitiously at work with ecards. You are all sitting at your desks in front of your computers, emails are flying back and forwards, why not attach an ecard to lighten the mood. This one is great if you have a meeting looming that nobody is looking forward to. Against a green background there are silhouettes of people sitting in a meeting with one standing, clearly the boss. 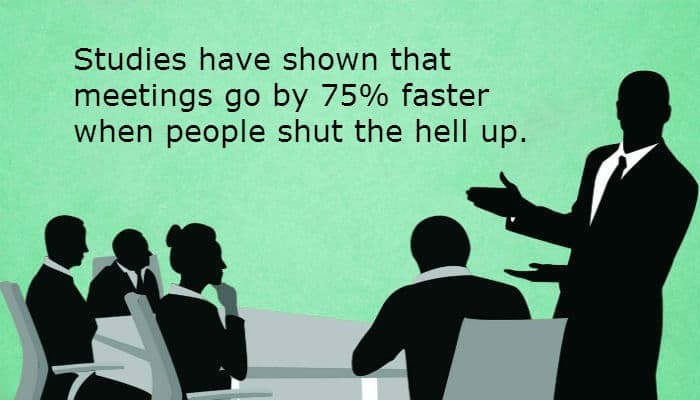 The legend reads “Studies have shown that meetings go by 75% faster when everyone shuts the hell up”, says it all really; sit down, shut up and get the hell out of there asap. Would your business like to make a really positive impression on your clients this coming Christmas holiday season, if so then check out our corporate holiday ecards.